Update: We've added cards and posters at the bottom of this post that you can print and distribute in your martial arts school. We're often asked about how to extend the life of the sparring gear we sell to martial artists. We've spent enough time working on this that we've got some pretty solid ways to care for protective foam gear. While this list may not be completely comprehensive, these are the easy ways to help extend the life of your gear. Of course, we'd be fools if we didn't take the opportunity to say that our gear, regardless of any care cycle, holds up better than our competitors. But enough self-promotion, on to the gear care recommendations! Don’t wrap your gear when it’s not in use. 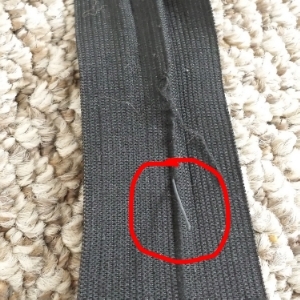 Simply connect the two ends of the Velcro strap, and let the rest of it hang. Double wrapping your protective gear overstretches the strap and compresses the foam in the sparring gear. Double wrapping the strap around your gear will compress the gear and make it less flexible. Keep your gear from being squished—the bottom of your gear bag isn't a great place for it! We recommend you gently tuck your hand gear into your helmet to keep the helmet from being crushed too easily. You may want to hook some or all of your gear to the outside of your gym / gear bag. 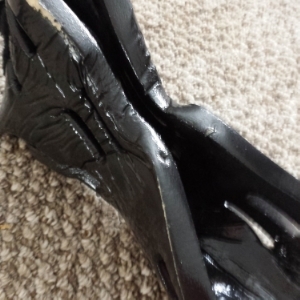 This is what happens when a strap is overstretched for a period of time - the rubber in the strap breaks leaving it less stretchy. If the gear starts to smell, you can clean it with water. Maybe you want to add some vinegar if it’s particularly smelly, but don’t use soap, other chemicals or put it in the washing machine. If you really want to give it a washing, you can rinse it off in the sink under a sprayer, or in the shower. Don’t put your gear on over shoes, socks, gloves, clothing or other gear. 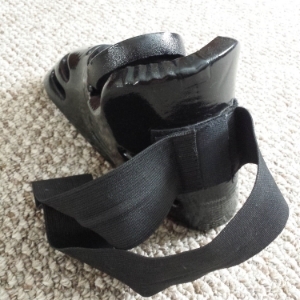 Don’t double wrap or stretch the Velcro strap unnecessarily. This boot was one of several we have from some early customers. This one was used for 9 months by a 12 year old boy. Mom & Dad reported that he was NOT nice to the gear, but he did follow the rules about taking care of it... most of the time. there's nothing wrong with the gear he had, except he outgrew it. No damage whatsoever. Keep children from "playing" while wearing gear. Sparring gear should only be worn in supervised settings with attentive adults. Remember, kids learn very quickly that they can hit harder when wearing gear... we've heard some horror stories of what can happen when this rule isn't followed! We see this mostly with kids - they drag their heels while walking around with gear on. It will take a lot of this to make the sparring gear unusable, but it certainly doesn't make the gear look good. None of these suggestions or tips for keeping your martial arts protective sparring gear are anything earth-shattering. However, we find that few people follow these ideas. Hopefully this article has given you some ideas on how to extend the life of your gear, whether it's something from whistlekick or another company. Feel free to download and distribute this sparring gear care sheet FEEL FREE TO DOWNLOAD AND DISTRIBUTE THIS SPARRING GEAR CARE poster - 8.5" x 11"